Sac-Osage Shop Hop is Here! Today is the first day of our first shop hop. Mary and I were just about "done in" yesterday when we left for home. We had anxiously been preparing for our first shop hop and everything was coming together --- when a brown truck appeared and out jumped the driver giving us the "look"! What? Two gigantic boxes of fabric. (Mary had just spent 3 days rearranging fabric---so we grinned and with the help of a couple of customers slid the boxes into the sewing room to store for a few days. With eager anticipation I awoke this morning only to hear the rumble of thunder and see flashes of light through the windows. We had arranged to go "Facebook Live" on KDKD's Facebook page this morning to kick off the shop hop so not a welcome sight. But the rain moved through and we went live! Check it out on KDKD Facebook or on our page here. We were barely finished when the first customers were in the door! Blocks are $4 at the 8 participating shops--and, we had a couple of shop hoppers that made it to all shops before 5 PM today! Check out our website for summer classes and events. 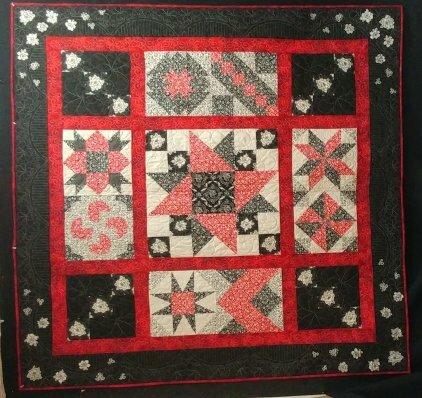 Christmas in July, jelly roll rugs, beginning piecing classes, "math for quilters"and more to come.